The fermentation of the entire grape cluster including the stem that attaches the berries to the vine, is commonly referred to as stem inclusion, bunch inclusion or whole cluster inclusion. De-stemming machinery is bypassed, leaving all the berries and attached stems intact. The Burgundians practiced 100% whole cluster inclusion for centuries as historically they had no de-stemmers. With the introduction of mechanical de-stemmers about 60 years ago, whole cluster fermentation was largely abandoned worldwide, or limited to fermentation of a small percentage of clusters. Today, a higher percentage of whole cluster fermentation is more fashionable, and there is renewed interest both in Burgundy and stateside. That said, it’s use in Pinot Noir vinification remains controversial, a wild card in the winemaker’s tool box that is a bit of a gamble. It is high stakes, stressful winemaking that can thoroughly enhance or dreadfully detract from a finished wine. There are no scientific, well-controlled studies that have shown reproducible effects, only considerable anecdotal opinions. 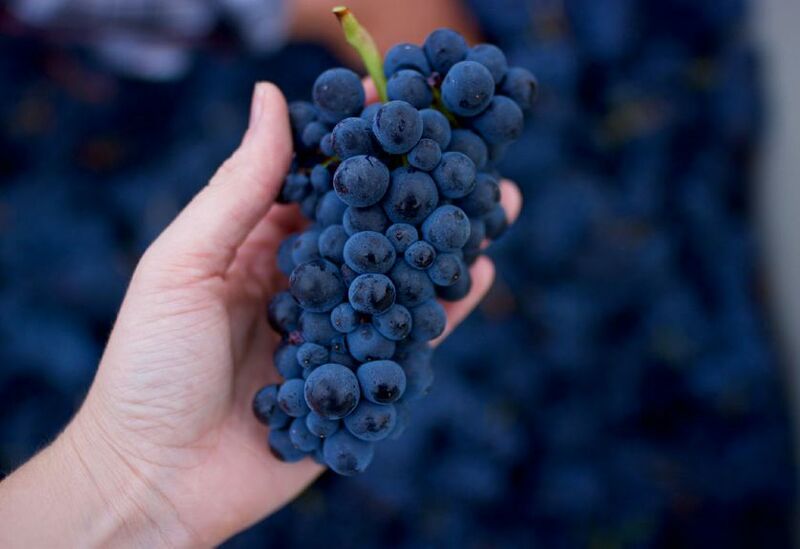 Professor Roger Boulton of UC Davis has pointed out that the contributions of whole cluster fermentation are at least due to two aspects: the intact berries of the whole cluster and the extraction and adsorption properties of the stems. The first is known as carbonic maceration where the berry cells undergo a biochemical modification internally (intra-berry anaerobic fermentation) producing a lifted fresh fruit-candy character. The inclusion of stems are the best vehicle for ensuring a higher percentage of whole berries. The second aspect is less clearly understood, but it is well known that the inclusion of stems can potentially give the wine a green or herbaceous character, presumably from the release of organic methoxypyrazine compounds from stems. (1) Added perfume of spice, pine sap, forest floor, black tea, rose petal, burnt tobacco. Winemaker Jeff Fink says, “The aromatics can be thrilling and literally spine-tingling. There can be a purity, depth and freshness to the bouquet that almost defies description.” Aromatics in Pinot Noir is the most challenging component to capture and whole cluster fermentation can potentially meet this challenge. (2) Changes in tannin structure and added tannins. Kevin Harvey, owner of Rhys Vineyards, remarks, “Speaking organoleptically…. the stems contribute some silky smooth mid-palate tannins while preventing the harsh seed tannin from being released since the grape remains encapsulated longer.” Also, the added tannins may contribute to the improved longevity of the wine. (4) More carbonic maceration (whole intra-berry fermentation) contributing to cooler and longer fermentations as well as markedly affecting the aroma and flavor profile. (5) Stability of the wine improved. For example, the stability of the wine’s color is increased because pigment is bound with tannin. (6) Lower final ABV. This is thought to be due in part to the stems releasing water during fermentation and pressing. This effect has never been quantified. (7) Added freshness to older Pinot Noir wines. Winemaker Ted Lemon told me, “A Pinot Noir that is ten years old and has a percentage of whole cluster will be more aromatically complex than the same wine that is 100% de-stemmed. (1) Potential for green, herbaceous and vegetative aromas and flavors from stem methoxypyrazines and other compounds, variously described as green beans, snap peas, broccoli, tomato leaves, green bell pepper, green tobacco, unlit cigar tobacco. (2) Potential for chalky astringency, bitterness and harsh tannins. That said, in general, most winemakers report that the increase in pH and presence of partial carbonic maceration tends to produce softer tannins in some cases. (3) Less intense color. Not universally observed and some winemakers note no reduction in pigmentation and even darker wines following whole cluster fermentation. (4) Increased potassium in the ferment and resulting increased pH. This may require acidification of the wine and loss of natural winemaking protocol. (5) Whole cluster fermentation can dominate the vineyard character. That said, others would argue that there is actually more expression of site (terroir). (6) The success of whole cluster fermentation is dependent on a multitude of factors including region, vineyard site (not all vineyards can be successfully fermented with 100% whole cluster), clones (some clones seem better suited to whole cluster fermentation such as Swan but the science is not known), and vintage. It is often the winemaker’s intuition that determines whether stems from a particular vineyard will impact the wine positively or negatively. (7) New World palates are fruit-centric and the savory elements whole cluster fermentation brings to Pinot Noir may not find widespread commercial appreciation or appeal. (8) The whole cluster fermentation process is more labor intensive and requires more attention than a de-stemmed wine. Pneumatic punch down devices and pump-overs cannot be employed as they can release more astringency into the ferment. (9) The winemaker’s imprint and whole cluster character can be a dominating feature of the wine. The controversy over the use of whole clusters in fermentation is centered on stem lignification. The view of many winemakers has been that the stems have to be mature, woody and brown (lignified) at harvest for whole cluster fermentation to be advantageous. The thought has been that if the stems are not lignified, they can add more undesirable harsh green tannins and herbaceous characters. Some have challenged this line of reasoning by pointing out that lignification is the hardening and firming up of cells in the stem, not a turning brown of the stem. That is, the stems may still be bright green, even when they are lignified appropriately. Others would claim the critical factor is the amount of sap in the stem and not its degree of lignification. Winemaker Carlo Mondavi of RAEN Winery has said, “Waiting for full brown stems is a major mistake in my opinion….if you wait that long you are looking at harvesting well north of 25º Brix. This can yield a wine of incredible bitterness and a pH that is not amenable to fermentation as well as a wine that is unstable naturally. I make our cuts where the rachis (stem) meets the shoot, an area that is brown and lignified. We make our harvesting cuts right in the middle of the browning area to minimize sap flowing into the juice.” Vineyards with well-drained rocky soils and lacking in late season rainfall tend to perform better with whole cluster fermentation since there is less tendency for the vine to push sap and water into the cluster. There are currently three basic camps domestically with regard to whole cluster fermentation. By far the largest group of winemakers completely de-stem prior to fermentation. The second largest group of winemakers like to add some percentage of whole clusters, say 10-30% up to 50% depending on numerous factors. Some in this group produce a limited bottling of 100% whole cluster Pinot Noir. The third and smallest number of winemakers are committed to 100% whole cluster fermentation if feasible in all their wines. Whole cluster has become a badge of courage and accomplishment and many winemakers include the words “whole cluster” on their appropriate wines. Where do I stand on whole cluster? I seem to prefer Pinot Noir wines with at least some whole cluster inclusion and a majority of my favorite domestic wines over the past forty years have been ones with at least some whole cluster inclusion.